Toronto, ON – The Ontario Hockey League today announced the Top OHL Performers of the Month for regular season games played in February 2017, including Erie Otters teammates Alex DeBrincat and Darren Raddysh, Sarnia Sting forward Adam Ruzicka and Owen Sound Attack goaltender Michael McNiven. For the second time this season, Chicago Blackhawks prospect Alex DeBrincat has been named OHL Player of the Month. 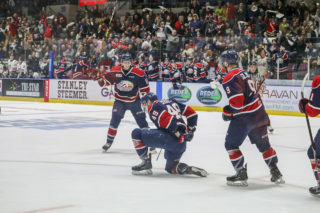 DeBrincat led all players with 32 points including 17 goals and 15 assists with a plus/minus rating of plus-10 in 12 games to help the Otters set a new franchise record with 14 consecutive wins. Now in the midst of an 18-game point streak and 14-game goal scoring streak, DeBrincat had eight different multi-point outings in the month of February, highlighted by a stretch of 13 points in three games from Feb. 4th to 11th. DeBrincat had two goals and three assists in an 8-4 road win over Ottawa on Feb. 4th. He followed that effort with a four point (2-2–4) night in a 6-1 win in Kingston the next day. 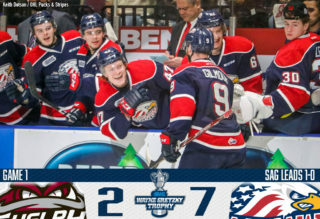 The Otters returned home on Feb. 11th to defeat the Saginaw Spirit 9-4 as DeBrincat registered a goal and three assists. In total, DeBrincat has received star of the game recognition nine different times, including three first star designations. His month of February included several Otters franchise milestones and career accomplishments including becoming the club’s all-time leading goal-scorer, reaching the 300-career point mark, recording his third consecutive 100-point campaign, becoming the second player in league history to register three-straight 50-goal seasons and passing Rob Schremp as the leading American goal-scorer in OHL history. A 19-year-old native of Farmington Hills, Mich., DeBrincat currently leads the OHL in scoring with 113 points including 55 goals and 58 assists in 54 games, helping steer the Otters into first place in the Western Conference. He is a three-time Pioneer Energy OHL Player of the Week recipient and a two-time CHL Player of the Week during the 2016-17 season. A former CHL and OHL Rookie of the Year in 2015, DeBrincat was Chicago’s second round (39th overall) pick in the 2016 NHL Draft. Veteran Erie Otters rearguard Darren Raddysh is the OHL Defenceman of the Month for the second time this season. 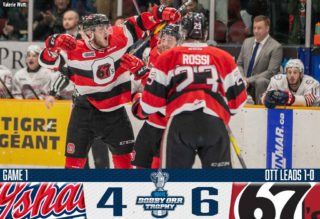 Raddysh led OHL defencemen with 17 points including three goals and 14 assists with a plus/minus rating of plus-14 in 12 games. 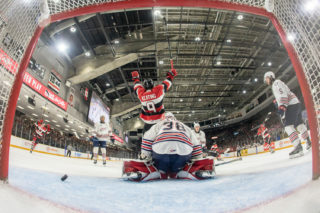 He had points in 10 of his 12 February contests, highlighted by a plus-4 outing in a commanding 5-1 win over the London Knights on Feb. 15th that included a goal and an assist. Raddysh recorded three points (1-2–3) on Feb. 25th as the Otters defeated the Barrie Colts 7-3 on the road. After becoming the Otters’ franchise leader in career points by a defenceman last month, Raddysh surpassed Chris Campoli’s single-season mark of 66 points on Feb. 27th with a pair of assists in a 4-2 loss to the Owen Sound Attack. 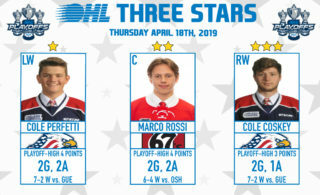 A 21-year-old native of Caledon, Ont., Raddysh leads OHL defencemen in points by a 10-point margin, recording 68 points including 16 goals and 52 assists in 53 games with the league’s second best plus/minus rating of plus-59. The fifth-year rearguard recently passed Shawn Szydlowski (2007-11) for fourth on the Otters’ all-time games played list. Though undrafted, Raddysh attended training camp with the San Jose Sharks this past September. 2017 NHL Draft prospect Adam Ruzicka of the Sarnia Sting is the OHL Rookie of the Month for February. Ruzicka elevated his game, leading all rookies with 12 points including nine goals and three assists in 12 games to help the Sting in their quest for a Western Conference playoff berth. The Slovakian forward’s month was highlighted by a trio of two-goal performances beginning on Feb. 2nd in North Bay as the Sting fell 7-4 to the Battalion. Ruzicka again scored twice on Feb. 15th against Guelph, earning first star honours as the Sting took a 6-2 win. His latest two-goal showing came in a key 6-3 road win over the Flint Firebirds on Feb. 25th where he again received first star recognition. A 17-year-old native of Bratislava, Slovakia, Ruzicka sits second in OHL rookie scoring with 41 points including 23 goals and 18 assists in 54 games this season. He represented Team Cherry at the 2017 Sherwin-Williams CHL/NHL Top Prospects Game in Quebec City and is ranked 27th among North American skaters in NHL Central Scoutings’ Midterm Draft Rankings. Ruzicka represented Slovakia at the 2017 IIHF World Junior Hockey Championship and was Sarnia’s first round (14th overall) pick in the 2016 CHL Import Draft. Montreal Canadiens prospect Michael McNiven of the Owen Sound Attack is the OHL Goaltender of the Month for February. McNiven’s outstanding month featured an 8-2-0-1 record with a 1.72 goals-against average, a .936 save percentage and three shutouts over 11 games to help the Attack climb the standings in the Midwest Division. McNiven’s three shutouts placed him ahead of Jordan Binnington on the Attack’s franchise leaderboard, giving him 11 on his OHL career. The first two came in back-t0-back games, beginning with a 26-save effort in a 5-0 road win over the Kingston Frontenacs on Feb. 12th. McNiven then made 16 saves in a 4-0 blanking of the visiting Flint Firebirds on Feb. 15th. His latest shutout came on Feb. 23rd, making 23 saves in a 5-0 road triumph over the division rival Kitchener Rangers. McNiven’s 31-save effort in a 7-3 victory over the London Knights on Feb. 26th was his 33rd win of the season, a new Attack single-season mark for a goaltender. A 19-year-old native of Georgetown, Ont., McNiven leads OHL goaltenders with a 2.13 goals-against average and 34 wins this season. 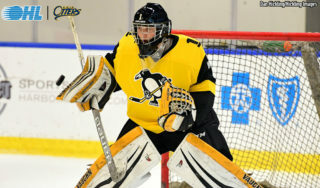 He also features a .921 save percentage and is tied for the league lead in shutouts with six. The third year veteran is currently second behind Binnington on the Attack’s franchise wins list with 70 in his OHL career. McNiven was signed as a free agent by the Montreal Canadiens in September 2015.